Lindsay Graham, a graduating physical therapy (PT) student at the George Washington University School of Medicine and Health Sciences (SMHS), was going about her day, thinking about sandwiches. One of her professors, Dhinu “Dr. J” Jayaseelan, DPT ’10, co-academic director of the orthopedic residency and assistant professor of health, human function, and rehabilitation sciences at SMHS, had once likened the human leg to a sandwich – the knee as the meat, the hip and ankle as the bread. It was an analogy that became a class joke, but Graham decided Dr. J was onto something. Between those two slices, which “better be pretty sturdy,” she added, is the meat of life, the “good stuff”: friends, families, hobbies. “For those of us graduating this weekend, a large part of that good stuff – a huge, juicy slice of tomato – really became physical therapy,” Graham said. The program, explained Reamer Bushardt, PharmD, PA-C, senior associate dean for health sciences and professor of physician assistant studies at SMHS, attracts physical therapists who are naturally generous with their time and spirit, hallmarks of a profession that prioritizes service to the community, clinical excellence, and academic accomplishments. 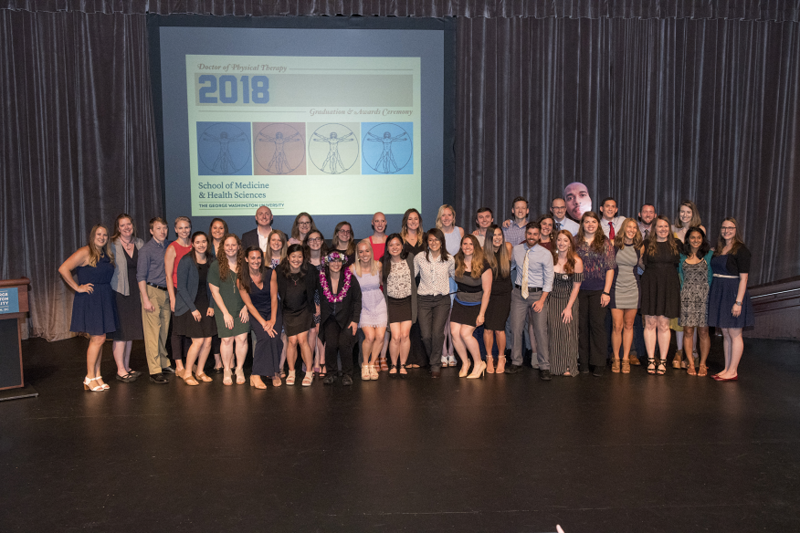 In a clear indication of the Class of 2018’s dedication, graduating students were recognized for their work as research assistants, class leaders, and volunteers at The Little Workers of the Sacred Heart Clinic PT Pro Bono Clinic. Unlike previous years, this 2018 class also boasted not one, but three recipients of the Service Excellence Award: Annie Golovcsenko, Alyssa Breslin, and Nora Arnold. Another proud alumna, Ivy Roe Jordan, DPT’11, received the Outstanding Alumni Award. “She was a joy as a student to work with, she’s a joy as a colleague to work with,” said Ellen Costello, PhD, director of the Physical Therapy Program and associate professor of health, human function, and rehabilitation sciences at SMHS. In a nod to the GW PT tradition of paying it forward, every graduating PT student participated in the class gift: white coats for the incoming cohort of budding PTs. In recognizing student achievements, the PT faculty presented the Academic Excellence Award to Heather Jentilet, an “all-around great and wonderful person,” according to Joe Signorino, DPT, clinical assistant professor of health, human function, and rehabilitation sciences at SMHS, and the Clinical Leadership Award to Matt Weber and Allison Dastugue. Additional honors, the Peer Recognition Award and the GW Alumni Association Prize for SMHS, were given to Sarah Guenzburger and Paige Anderson, respectively. Anderson, who co-founded the APTA special interest group to advocate for the PT profession, was also the recipient of the prestigious Jean Johnson Award. In one of the final award presentations, the faculty turned the podium over to the students, who gave the Outstanding Faculty Award. Holly Jonely, SCD, associate director of the PT program, co-academic director of the orthopedic residency, and assistant professor of health, human function, and rehabilitation sciences at SMHS, hugged Golovcsenko and wiped away tears as she accepted her award.